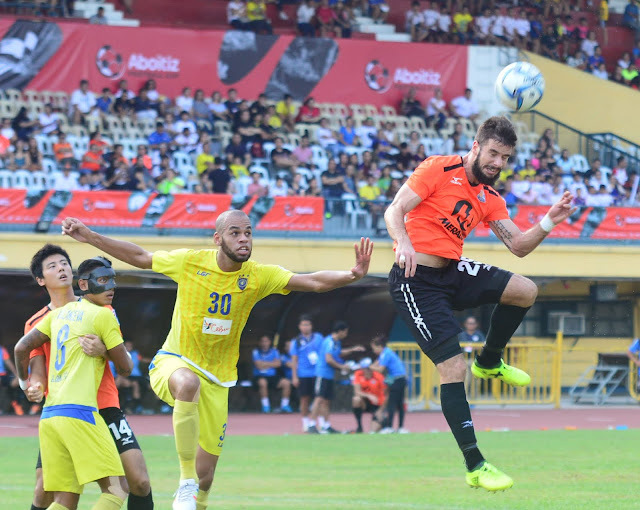 MANILA—Global-Cebu FC players Milan Nikolic and Anton del Rosario took to social media to air their ire for still not getting paid by team owner Mark Jarvis. On his lengthy Facebook status post, Nikolic called out Jarvis for making promises that he couldn't keep, especially with paying the team's dues to its players. "[This is] the first time in my career [in which] I saw that one person can own [a] club without money," Nikolic said. Nikolic then claimed that because of the non-payment of the team for his services as their player, he was evicted from the condo unit that he is renting while he and his family were living here. He was supposed to meet up with Jarvis before he went back to Serbia but the team owner was a no-show. In the same fashion, del Rosario, a former Azkal and the founder of the 7s Football League, also wrote a status post on his Facebook account, seemingly calling out Jarvis as well. "How is it [that] the manager goes and talks to players about signing them and advancing wages when a lot of the players still haven't gotten paid?" del Rosario asked. Del Rosario suited for Global-Cebu FC last year after almost a year of absence from professional football. He played for the team for the entirety of the Copa Paulino Alcantara. In a status post earlier this year, del Rosario revealed that some of his teammates mostly fed on cup noodles because they cannot put home-cooked meals on their table due to lack of finances. With such state, most fans and football enthusiasts in the country are doubtful of Global's capability to maintain their spot at the rebooted Philippine Premier League. Questions now linger if they will see action in the PPL's kick-off especially now that some of the teams like Ceres-Negros FC and Kaya-Iloilo FC have already announced their line up for the coming season. Since 2018, the Cebuano club has struggled immensely to survive, losing key players to either the rival teams or to teams from neighbouring leagues in the region. The team recently lost young talent, Jordan Jarvis to Eastern Sports Club of Hong Kong. Jordan Jarvis is the son of club owner, Mark Jarvis.